Last year, Maricopa County was named the fastest growing county in the country. From large business developments to smaller community projects that enhance the quality of life for individuals, Maricopa County is a place where businesses and people are prospering. The County and the Board of Supervisors have supported holistic efforts to elevate Maricopa County and its residents. These efforts include strengthening the community through innovative and unique partnerships and identifying solutions to meet community needs. Read more about what the County accomplished this year. Learn more about some of the most impactful projects happening in each district. Maricopa County’s first district includes the community of Ahwatukee, and the cities and towns of Chandler, Gilbert, Mesa, Queen Creek, and Tempe. Supervisor Denny Barney, a Gilbert resident, and long-time County Supervisor, highlighted the 2018 project that he believes made a significant impact in District 1. In 2018, Gilbert started development on two key parks to provide needed multi-use recreational areas for the surrounding communities. The two parks are currently flood control basins that will be transformed to be both functional during storms but useful to the community year-round with the addition of baseball fields, playgrounds, and tennis courts. Read more about the park and community development. Maricopa’s second district encompasses several Valley communities, including Apache Junction, Carefree, Cave Creek, Fort McDowell Yavapai Nation, Foundation Hills, Gilbert, Mesa, Paradise Valley, Phoenix, Scottsdale, and Salt River Pima – Maricopa Indian Community Scottsdale. Supervisor Chucri, a native Arizonan, is passionate about helping communities thrive. Thanks to collaboration and innovation, District 2 residents will be seeing a new East Valley animal shelter to help increase the quality of care the County provides to rescue animals, reduce the length of stay for animals, and improve the experience for customers who want to adopt. The current facility cannot meet the county’s long-term needs and does not meet nationally-accepted standards of care. From a business perspective, Maricopa County’s East Valley campus offers an ideal location because there’s no land cost and the infrastructure already exists. Operations at both county-owned animal shelters will continue as normal for the time being. The Rio Salado shelter will remain open until the new East Valley shelter is built. District 3 includes Anthem, Desert Hills, New River, Paradise Valley, and parts of Phoenix. Recently appointed Chairman of the Board of Supervisors and former Phoenix City Councilman, Bill Gates was elected County Supervisor to District 3 in 2016. For Supervisor Gates, bringing expanded access to health care to the county is important. HonorHealth is opening a sixth hospital in North Phoenix, just south of Anthem. Groundbreaking is scheduled for this month. The hospital will provide more than 40 beds and a 24-hour emergency room. Learn more about the Sonoran Medical Center campus. 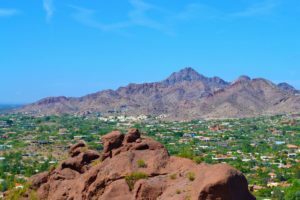 Maricopa County’s fourth district encompasses Avondale, Buckeye, El Mirage, Glendale, Goodyear, Litchfield Park, Peoria, Sun City, Sun City West, Surprise, Wickenburg, and Youngtown. Supervisor Clint Hickman is proud of his district and works diligently to serve Arizona businesses and families. In 2018, District 4 County leaders decided to fund a pilot program at Luke Air Force Base. As a part of the program, the County is supporting the creation of a Millitary Veteran Success Center- West Valley. Staffed by a new support team of four full-time staff, the Center will provide: case management for transitioning military, veterans, and their spouses; education and career paths with a focus on employment, including degrees certificates, apprenticeships, scholarships, and other services available publicly and privately; job placement services; and so much more to the West Valley’s community of veterans. Supervisor Steve Gallardo, a former state legislator, who was elected in 2014, represents District 5. The district includes Avondale, Buckeye, Gila Bend, the Gila River Indian Community, Glendale, Goodyear, Guadalupe, Phoenix, Tolleson, and many smaller communities. Just last month, the Board of Supervisors approved an approximately 950-acre site, which will be home to the latest utility-scale solar electric generating station in Maricopa County. Known as Sun Streams Solar, this 150-megawatt facility will include large-scale battery technology for energy storage, and is the most recent in a long list of solar generating facilities in west-central Maricopa County. Like other similar facilities in this area, Sun Streams will employ low water use, photovoltaic technology to provide clean, renewable energy to homes and businesses. This facility reinforces Maricopa County as an economic and technological leader for solar energy development. Interested in learning more about the growth in Maricopa County? Attend the February 20 Economic Development Insiders Series focused on the State of Maricopa County. The event will feature county officials and community leaders to highlight the economic development efforts across the county. Register today!